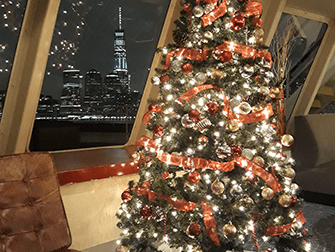 Christmas Eve dinner cruises in New York are a perfect option if you want to do something truly festive and unique for Christmas. Skip the busy restaurants and relax by cruising the Hudson River while enjoying a Christmas dinner. Dress to impress, because taking a cruise, means you’ll enjoy a special, romantic, merry Christmas Eve. You’ll have lots of photo opportunities to help you fondly commemorate this magical Christmas Eve! This four-hour cruise offers great views of the skyline accompanied by a buffed dinner and music. Board this luxury liner and stroll through its lower level while sipping on a complimentary glass of sparkling wine or apple juice. Note: alcohol served only to those over 21 years, bring a valid id. This cruise also offers premium tickets which include an open bar and access to the open-air, upper levels of the boat. Are you looking for a fancy way to spend your Christmas Eve in New York? Board the Atlantica and enjoy panoramic views of the Statue of Liberty, the Brooklyn Bridge and more. You’ll have a wonderful, festive evening with a three-course dinner and an open bar in the grand dining room. After dinner, you can descend to the dance floor to enjoy music from the live DJ. This cruise offers a very family friendly start to your holidays. The kids will enjoy the great brunch buffet, especially the large selection of desserts on offer, while the adults sip their bottomless mimosas. A DJ and a jazz band will take care of the music while you cruise past some of the world’s most famous landmarks. On this 1920’s vintage-style yacht, enjoy hot chocolate with cookies and Christmas carols performed by a live band to get you in to the Christmas spirit. Admire the great views as you pass by the Manhattan skyline. Available on the 24th of December, as well as many other dates throughout November and December! This World Yacht dinner cruise is a great, affordable way to spend your Christmas Eve. Take your family on this two-hour Hudson River cruise. 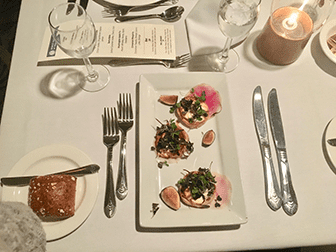 Enjoy a four course dinner, with views of the Manhattan skyline. Choose one of the upgrade options, like an open bar. My favourite boat for a dinner cruise in New York, the Bateaux is also hosting a Christmas Eve Dinner Cruise. I can definitely recommend this cruise to you: the large windows offer incredible views of the skyline from everywhere on the boat. The onboard chef will take care of the three course dinner, whilst a live band entertains you with a variety of music genres. Dress code: collared shirts for gentlemen (jackets requested). For women, cocktail wear, a dress or dressy-casual attire. Dark or dressy jeans are acceptable. No casual jeans, t-shirts, shorts, athletic shoes, or flip flops.